Nylon top coat is used over the regular enamelled copper wires to enhance the mechanical properties of insulation coat. Normal enamelled coating is stressed in coil winding applications like high speed auto winding and auto coil insertions in slots. Nylon top coat exhibits a smooth and tough, slippery surface of top layer of insulation, thus, reducing chances of insulation damage and failures related to mechanical abuse of the thin insulation layer. 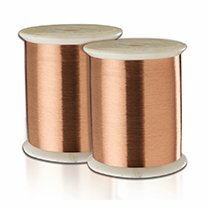 Nylon top coat wires can be used in high speed windings for armature coils of home appliances, power tools, auto coiling machines for switch gears miniature coils in electronics etc.